The EM2010 Noise Monitor is designed for medium and long term environmental noise monitoring. It is the quickest and easiest to install of all our monitoring systems and comes as a complete package with mobile phone connection already active. This unit is ideal for any noise monitoring application that demands a unit that meets IEC 61672 and would benefit from access to the noise measurements through a standard web browser. The EM2010 Noise Monitor consists of an Outdoor Microphone, a small box with the processing unit, and a power supply. It can be connected up in minutes - just connect the microphone and power supply to the processor and away it goes. The unit will automatically measure the periodic Leq and L90, storing the results internally for up to 1 year and uploading them regularly to the web server. The noise reports are viewed by logging in to a web site and selecting the days of interest. The results can be viewed in a tabular or graphical format, or you can download them to Excel (or similar spreadsheet program) and create your own reports. The microphone has a standard thread, so it can be mounted on a tripod for short term use or on a mast for long term noise monitoring. The processing unit is enclosed in a die-case aluminium box, but for double protection and ease of powering (the power supply unit is not weatherproof) we recommend mounting the processor and power supply in the Outdoor Enclosure (order code EMENC). You can see the Outdoor Enclosure on the Options tab and read more about installing the monitor on our Installation page. The EM2010P is a portable version of the same noise monitor. If you need to regularly relocate the monitor or have no power at the monitoring location then please see the EM2010P Portable Wireless Noise Monitor. The functionality and noise measurements are identical to the EM2010, but it is supplied in a weatherproof case with a 7-day rechargeable battery pack and microphone tripod. The EM2010 connects to the Internet over the mobile phone network (GSM / 3G) but also includes a WiFi connection for on-site setting up and diagnostics. Do I Need a Phone Contract? No, the EM2010 comes complete and ready to go, as long as it is in a region with a mobile phone signal. The price includes the modem (built in to the noise processor box) and SIM. The price for the EM2010/G also includes the first year of your contract, which covers the use of the installed SIM (no extra data charges) and access to the web server to view the reports. After the first year, the cost to renew this contract is in the Ordering box above. To protect against inflation we can provide you with a multi-year contract from the start, otherwise renewing can be carried out when the time comes. The EM2010 logs the noise measurements throughout the day, usually storing the Leq and the L90 (along with a few other parameters) every five minutes. The monitor connects to the Internet every 15 minutes using the built-in modem and antenna and sends the latest measurements to the server. To view measurements from the previous days, weeks, months, you just need access to the Internet and a standard web browser. You navigate to the data access web site and log in. For more information on the presentation of the noise measurements, please visit our Reports tab. 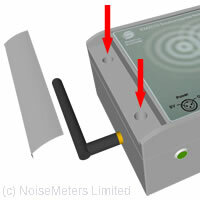 The EM2010 noise monitor also has a WiFi connection available. This provides an easy on-site interface, which is used for configuring and calibrating. The monitor provides its own WiFi hotspot. Connection to it is similar to connecting to a router and you then use a standard web browser. The benefit is that you don't have to open boxes to get access to the unit during servicing and on-site configuration. The standard EM2010 includes the parts you need to mount the noise processor indoors, with the microphone mounted outside. You will need to provide the brackets to mount the microphone. Parts are available on the Options tab for mounting the processor outdoors. If you need to relocate the monitor on a regular basis or are monitoring in an area with no power available then please have a look at the Portable Noise Monitor. This method involves mounting the processor unit indoors with a cable running outside to the microphone. This provides security for the processor and protects it against the weather for long term monitoring. In this case no additional enclosure is needed for the processor. 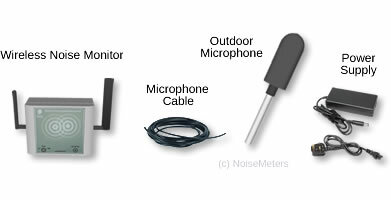 The noise processor should be mounted within 3 m of the microphone, if you choose to use the standard microphone cable. Otherwise, this can be extended to up to 10 m using standard RG-174 coaxial cable. The processor also needs power. It is supplied with a power supply unit, similar to that used for a laptop computer. Removing the panel at either side reveals the screw holes for mounting the processor. It can be mounted to almost any surface using suitable screws. The two antennas (one for GSM connection and the other for direct WiFi connection) are attached to the noise processor box, so there is no need to make separate mounting arrangements for them. The only connections to the processor are for power and the microphone. 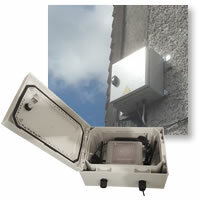 For long term outdoor use we recommend mounting the processor and its power supply inside a weatherproof enclosure. This provides double protection for the processor and also provides protection for the power supply unit. With the EMENC option, the noise processor is supplied in a suitable weatherproof enclosure, which can be wall mounted or mast mounted with the EMENCPOLE option. The Outdoor Microphone assembly is supplied on a rod (shown on the right). At the base of the rod is a standard thread for mounting on a tripod, mast or wall-bracket. To operate correctly and for the rain-shield to protect the microphone, it should be mounted vertically. The EM2010 is provided with a 3 m microphone cable. This can be extended up to 10 m using RG-174 coaxial cable. The EMENC outdoor enclosure option also includes a 1.5 m mast for mounting the microphone. You can view the measurements, produce reports and download the data to your computer if you need a local copy. This can be done from anywhere, as long as you have a connection to the Internet and username/password. Your online account can handle multiple noise monitors. If you have more than one EM2010 (fixed, mobile or mixed) they will all upload their measurements to the same account for easier measurement management. You can configure multiple projects within the account and assign monitors to these projects. The reporting system is designed to deal with anything from a single noise monitor to multiple monitoring sites. Guests can be added to your account and given access just to the projects that are of interest to them. Noise charts show the sound level changes over time. Plotting the LAeq, L90, L10 and Lmax, the chart on the right clearly shows the day and night time sound levels over a period of four days. Charts can be printed or exported into PNG, JPEG, PDF or vector format. 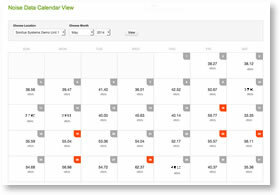 A calendar view gives a summary of the average sound level (LAeq) for the period of interest each day. It clearly indicates if the limit has been exceeded on that day. Zoom the image on the right for a clearer view. Clicking on a day provides a more detailed overview, including the noise limit times and a convenient link through to the sound level charts and noise tables. Results can also be presented on-screen in a simple tabular format. As with the Noise Chart display, you can select the dates for the chart and, if you have multiple noise monitors, you can select which one to view. These tables can be exported for custom analysis. For noise compliance monitoring it can be essential to know about any problems as they occur, rather than looking at a report a few days later. The EM2010 noise monitors and reporting system can be configured to send you a text message or an email alert when an LAeq limit has been exceeded. The noise charts can be exported to the standard PNG, JPEG and PDF formats for inclusion in any custom reports generated in a word processor or similar application. Tabular reports can be exported to the standard CSV format, which can be loaded into Excel or many other programs for further analysis and reporting. The following items are available as options for the EM2010 Environmental Noise Monitor. Those marked [Factory Option] must be carried out at the time of manufacture, or the equipment will have to be returned for upgrade. Other options can be added at any time. The standard EM2010/G meets the sound level meter standard IEC 61672 to Class 2 and ANSI S1.4 to Type 2. If your regulations demand the use of a Class 1 or Type 1 system then you should add EM2010UPG1 option to your order. 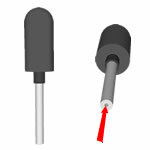 As the whole EM2010 measurement chain meets Class 1, the main change is the microphone capsule. Operating and installing the unit are identical to the Class 2 version. Order code EMENC is for the weatherproof outdoor box, which can be wall mounted (brackets included) or pole mounted (see pole mount option below). External dimensions approx: 300 x 200 x 150 mm. When ordered at the same time as the noise monitor, the EM2010 will come installed inside the case. All you need to do is mount the box on a wall, wire the microphone in and provide the electrical power wiring. A 1.5 m mast is also included for mounting the microphone. Order code EMENCPOLE is for a pole mounting bracket for the EMENC enclosure listed above. This bracket will enabled you to mount the weatherproof enclosure on a lamp post or similar pole. In the example here the box is mounted on a lamp post with the microphone mounted on the side of the EMENC box. This option is just for the bracket, you also need the EMENC enclosure. For a positive identification of the noise source there is no better way than to listen to a recording. The EM2010/AG can be set to record the audio when preset conditions are met (trigger levels, etc). The audio is automatically uploaded to the server so you can listen when viewing the reports. 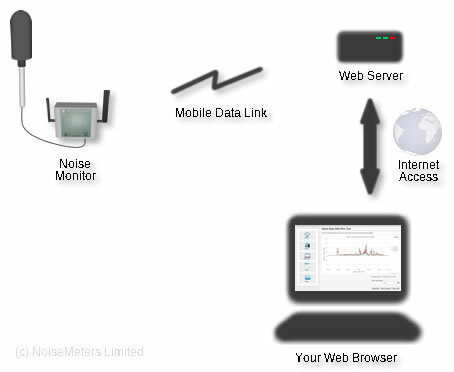 When you order the EM2010/AG Environmental Noise Monitor the price includes the mobile connection and reporting contract for the first year. This costs more due to the much larger amount of data involved. The EM2010 is supplied with a 3 m microphone cable. This can be extended to 10 m using standard 50 ohm RG-174 coaxial cable. If you want to download the measurements and work with them locally we recommend using Excel or similar spreadsheet. The files are simple CSV text files that will load into many different applications.